St. Peter’s was in need of a prayer chapel — a quiet, private space to be used by parishioners for prayer, meditation and reflection. We were asked to remodel an existing space that was, in the 1950s, used as the church office. This renovation project meant a new roof (and ceiling). It required the removal of the structural steel roof framing and concrete roof planks in order to create the space for Grace Chapel’s vaulted ceiling. 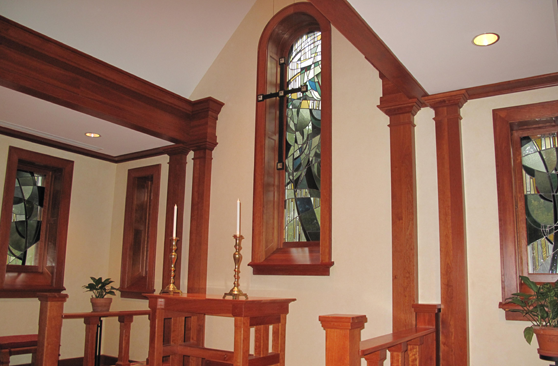 The church wanted custom millwork which included solid cherry moldings and panel work. The new windows were designed to incorporate custom art glass that was donated by a parishioner.